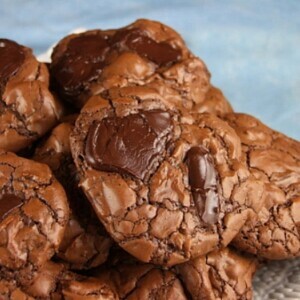 This recipe has been featured in a post on The Recipe Girl blog: Triple Chocolate Chunk Cookies. 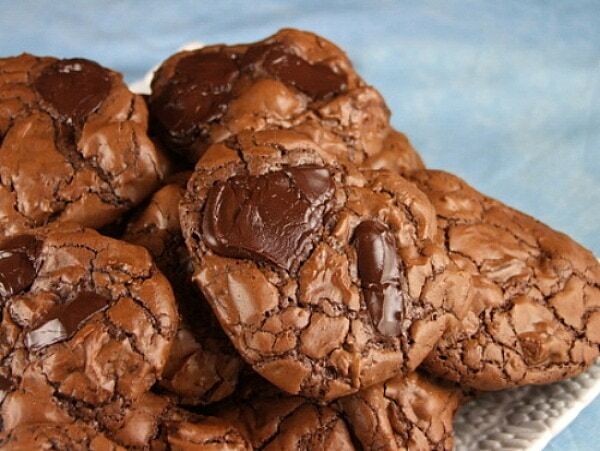 Chocolate lovers will rejoice in these cookies that are completely overloaded with chocolate. 1. Preheat oven to 350°F. Line baking sheets with parchment paper. 2. Place chocolate chips and butter in a large, heatproof (metal or pyrex) bowl set over a pan of simmering water. Stir until melted and smooth. 3. In another bowl, whisk together flour, baking powder and salt; set aside. 4. In a large bowl, with electric mixer beat eggs, brown sugar and vanilla on high speed until light and fluffy. Reduce speed to low and beat in the melted chocolate mixture. Then mix in dry ingredients and blend just until combined. Stir in chocolate chunks, but leave out the optional, additional chunks. 5. Drop heaping Tablespoonfuls of dough onto baking sheets, keeping a round shape as much as possible- 2 to 3 inches apart. If you're using the extra chopped chocolate bar, place 2 to 3 chunks on top of each cookie. 6. Bake until cookies are shiny and crackly, yet still soft in the center, 12 to 14 minutes. Cool on cookie sheets for about 10 minutes before transferring to a cooling rack with a spatula. *Nestle sells packages of "chocolate chunks" in the baking aisle of your grocery store. *You can certainly substitute chopped chocolate for chips. *These cookies contain a lot of chocolate, and are therefore extremely chocolatey and rich. You can cut the recipe in half to make just 2 dozen cookies if you don't wish to invest in so much chocolate!